RZI Lighting in New Orleans has taken delivery of 24 double-reeved, half-ton Chain Master motor hoists with 60-foot chains. The extensive product line ranges from installation to complex scene changes and complete automation systems. "We supply the region with cross-rental equipment including rigging, hoists, truss and ground-support rigs," said Ray Ziegler, RZI Lighting head. 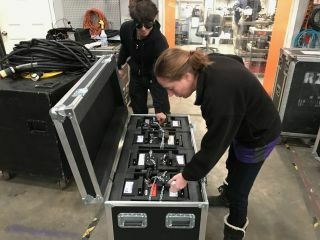 "We augment other production companies in town supplying the rigging when they do larger-format shows. We expect to use the new Chain Master hoists in most of the local venues those companies service." The Chain Master hoists were suggested by another rental company that "had a great experience with the brand," said Ziegler. "The hoists are very well built and will stand up to the rigors of the rental market. We're glad to add them to our rigging department inventory."